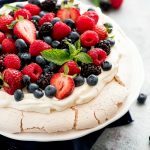 I first shared this Berry Topped Pavlova on Centsless Meals where I am a contributor. 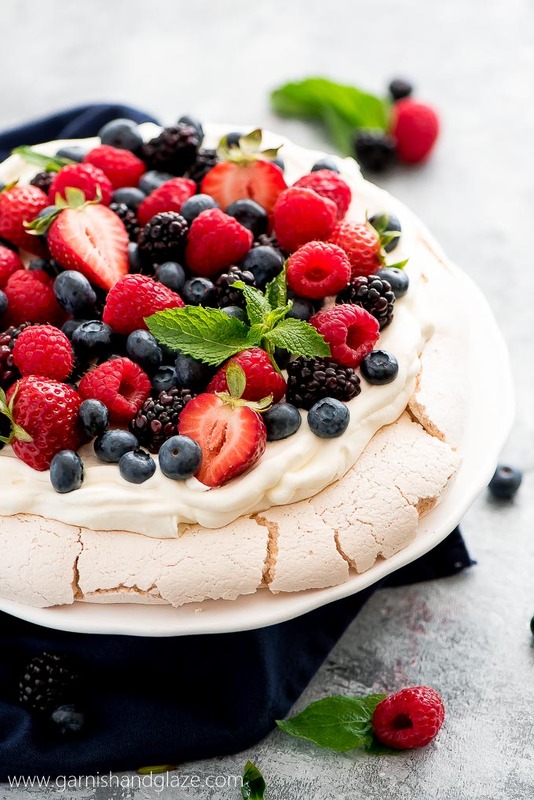 Mixed Berry Pavlova is the perfect summer party dessert! 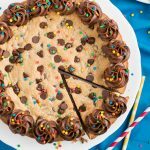 It’s simple, beautiful, refreshing, and a definite crowd pleaser. Anyone else eat ten times their weight in berries during the summer? We pretty much inhale them at my house so we stock up at Costco. We use them in smoothies, granola, cake, and this gorgeous Mixed Berry Pavlova. 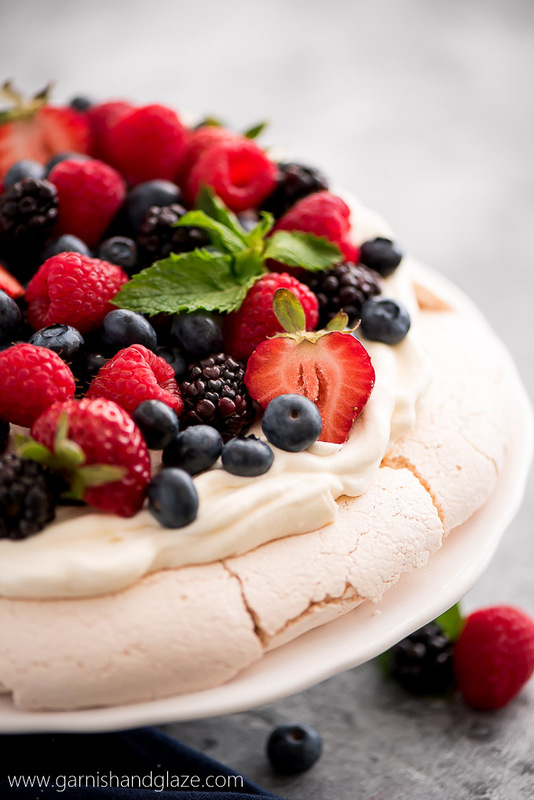 Have you ever had Pavlova or even heard of it? 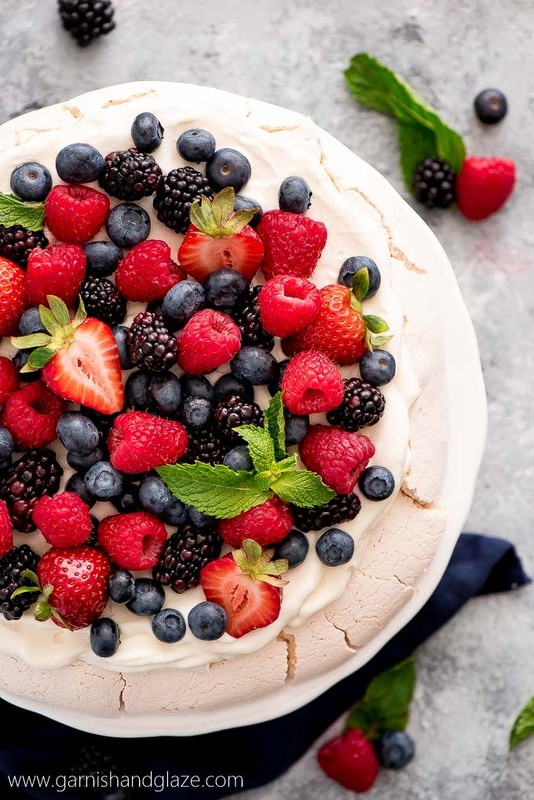 It is a meringue-based dessert that is named after Anna Pavlova, a Russian ballerina and is actually popular in Australia. Something about her performing there… I don’t know. 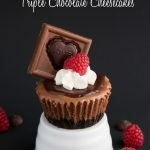 What matters is that you know this is amazing and perfect to serve to your next dinner guests. The base is meringue- egg white and sugar that’s baked. A delicious crisp crust is formed with a soft and airy inside. Then it’s topped with whipped cream. In Australia they don’t usually sweeten the cream but I think everything is better with a little suga. And then to top it off you add as many berries as your heart desires. I’ve seen pavlova served a lot with kiwi and strawberries but today it’s all about the berries. As much as I love a rich chocolate turtle brownie, the kind of dessert I crave in the summer heat, especially with the intense humidity here on Long Island, is something light and refreshing like Mini Berry Tarts, Raspberry Lemon Cheesecake, and this Berry Topped Pavlova. Yes, you have to prepare this in advance to give it time to cool but it’s really quite simple. It takes just 5 minutes to get the meringue whipped up and in the oven. Once it’s done baking, just let it completely cool on a wire rack. After it is room temperature you can assemble it or keep it uncovered in a cold oven even overnight. If placed in the fridge, the delicious crispy shell will become soft. 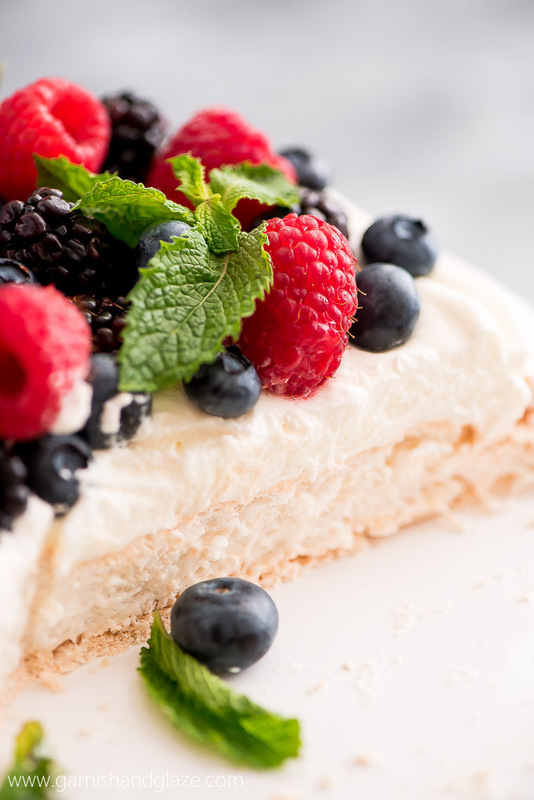 Then, before serving, top the pavlova with whipped cream, all the fresh berries, and a few mint leaves if you’re feeling fancy. Beautiful, simple, fresh, and delicious! Enjoy! Place a piece of parchment paper on a baking sheet and draw a 9-inch circle using a plate as a template. 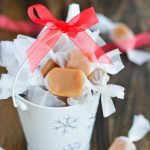 Flip the parchment paper over and set aside. In the bowl of a stand mixer, beat egg whites until stiff peaks. Slowly stream in the sugar while mixing. Beat until thick and glossy. Add the lemon juice, vanilla, and corn starch and gently fold in. Spread mixture onto the parchment paper, spreading it evenly to the edge of the drawn circle. Bake for 60 minutes. Cool completely on a wire rack before adding toppings. 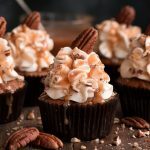 Beat the whipping cream with sugar until soft peaks. Spread over cooled pavlova and then top with berries and a few mint leaves. Slice and serve. I only have a hand mixer. Can I make the Pavlova with that??? ?